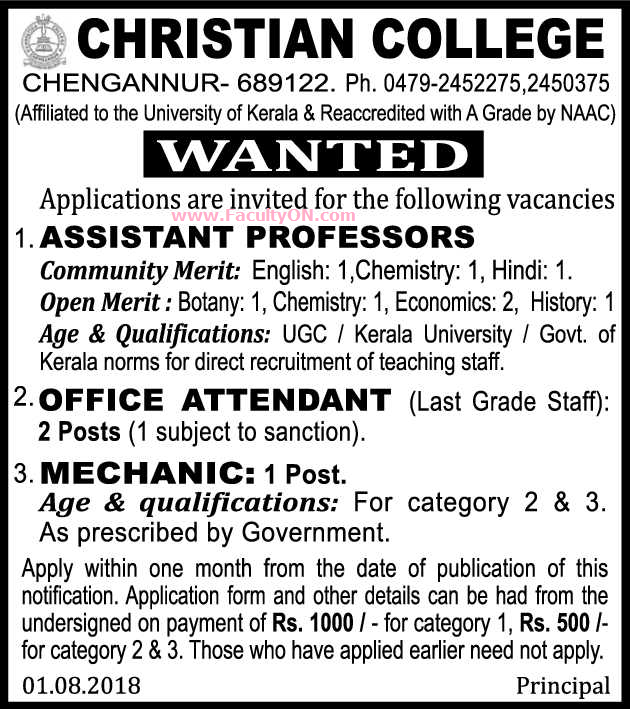 Christian College, Chengannur has advertised in THE HINDU newspaper for recruitment of Assistant Professor Plus Non-Faculty jobs vacancies. Interested and eligible job aspirants are requested to apply within 30 days from 08th August 2018. Check out further more details below. About College: Christian College, Chengannur is owned and managed by the Malankara Mar Thoma Syrian Church and is affiliated to the University of Kerala. Founded in 1964 by Rt. Rev. Dr. Mathews Mar Athanasius, Christian College, Chengannur towers high as a centre of excellence in education on a hill top with pristine beauty. The college always had its focus on academic excellence, formation of character, emphasis on spread of spiritual truth and trust in god so as to produce intellectually well-trained, morally upright, socially conscious and spiritually inspired young men and women. As per UGC / Kerala University / Govt of Kerala norms. How to apply: Applicants are requested to send their filled-in applications along with copies of certificates and recent PP size photo to the postal address to the Chairman within 30 days.